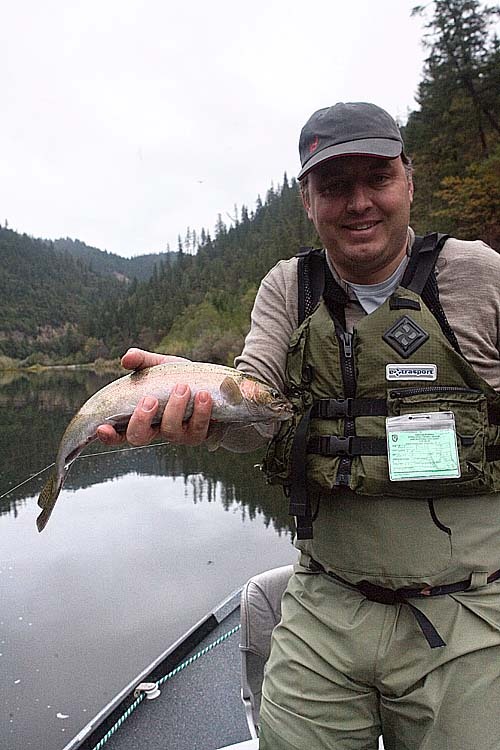 We returned again to Marble Mountain Ranch to fish the Klamath for steelhead. Those going were Mike Pinelli, his son Andy from Portland, Homer Eaton, Gerson Finlev, Stephen Sykes and Mike McGuire. The big news this year was not a steelhead at all, but a 40 inch chinook salmon landed by Mike Pinelli after an epic half hour fight. 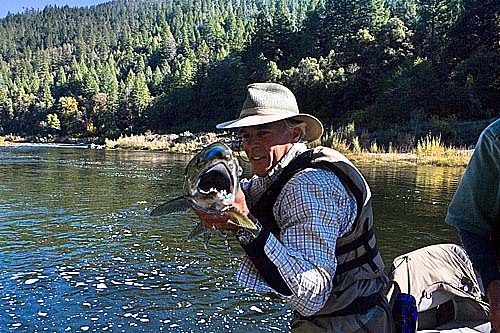 The fish was hooked at the tailout of pool above a rapid by Mike from the aft position of guide Doug Cole's drift boat. Twenty minutes of maneuvering in the pool showed no sign of moving that fish. Finally they took a gamble and ran the boat throught the rapid to put a pull on the fish from downstream. The line and considerable quantities of backing screamed off Mike's reel. The fish followed them. When he got tightened up again the fish was still there. Several more exchanges of line and backing between the fish and Mike occurred. Finally it tired enough for Doug to net it. It was a beauty. Most salmon that far upriver are pretty beat up, frayed fins and white patches on their skin. This one was fresh, strong and in superb condition. After pictures it was released. The rest of us had some success catching steelhead, one or two adults apiece and a number of half-pounders.